Before Phoun started at Epic Arts, he says he wasn’t much of an artist. Even though his dad was a tattoo artist, his connections to the arts were limited to some simple drawings on the street. More impressive is his path to becoming the artist he is today. But Phoun’s story is not only that of a young man becoming an artist. It’s also the story of a shy young man developing into an open, communicative and contagiously happy guy. Phoun with his latest drawing in Kampot, Cambodia. In his early teens Phoun was involved in an accident which caused him to lose his right forearm. After his accident Phoun stayed at home and helped his family, he can recall this time clearly. He felt that he would never lead a successful life and he was left to help at home, his day-to-day life was feeding their pigs, going fishing, looking after the cows and doing housework. This all changed when at a wedding party, his uncle first told him about Epic Arts and the programs they implement to promote inclusion and diversity. 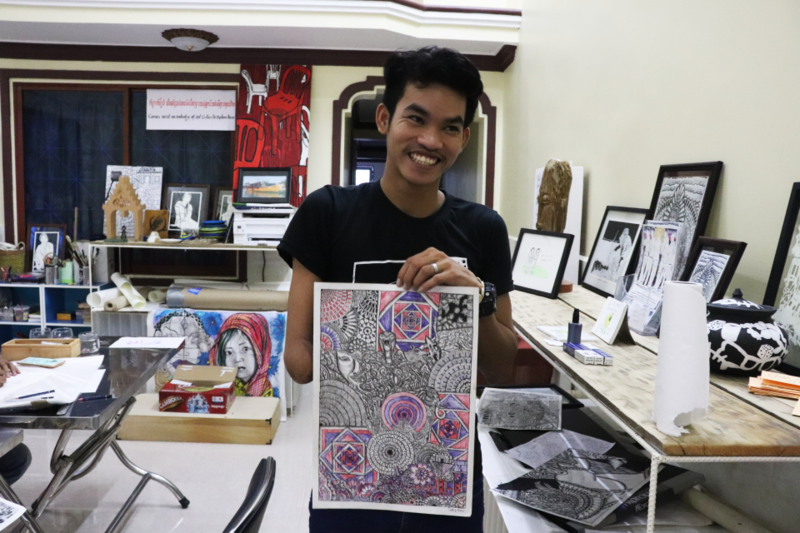 Phoun was instantly eager to become involved with Epic Arts, and – after his family’s approval – joined the Inclusive Arts Course (IAC) in 2015. This was the first time that Phoun had the chance to study and learn various kinds of art forms, ranging from dance, drama and visual arts as well as computer skills, English and general life skills. Never having been outside of his commune very much, Phoun felt hesitant going into the course. New people, new tasks and not knowing what to expect was daunting, however his first unease vanished quickly when he got to know the other students. It was during this time that Phoun was able to discover and develop his talent for drawing. Besides the discovery of his passion for drawing, Phoun says that dancing is the most important thing that he learnt during the two year course. But Phoun’s journey at Epic Arts didn’t end at the conclusion of his IAC course. After his graduation, Phoun was employed as part of the social enterprise programme, in a role designed around his development as an visual artist. He was mentored by kampot-based artist Nic Grey, had time to develop his drawing style, worked on creative briefs and helped create products at Epic Creations. He also began working at Epic Arts Cafe part-time, in the inclusive work environment people with and without disabilities work together serving locals, tourists and expats alike. Working in the café enabled Phoun to improve his communication skills. 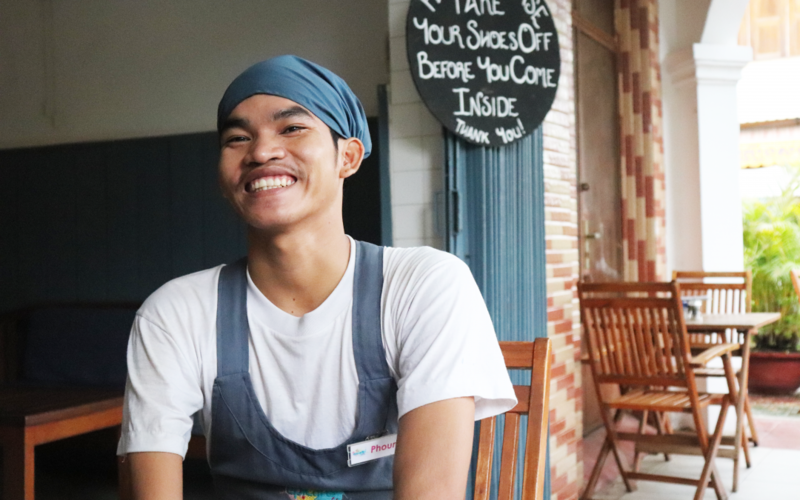 Phoun was able to advance his English speaking skills and also develop his Cambodian Sign Language skills.“Having one hand isn’t a problem when signing,” Phoun says, “I’ve made such good friends at Epic Arts, and they can always understand me”. Communicating with people from all over the world on a daily basis in the café has helped Phoun foster his self-confidence even more, especially in terms of his spoken English. Having left school after grade 4, he describes his previous English skills as low as 10%. Now he says he considers himself to be at 40% which is huge progress in a short amount of time. Phoun at the Epic Arts Café. Being asked how he would describe his life now compared to before he became a part of Epic Arts, Phoun smiles. “It’s much better,” he says. 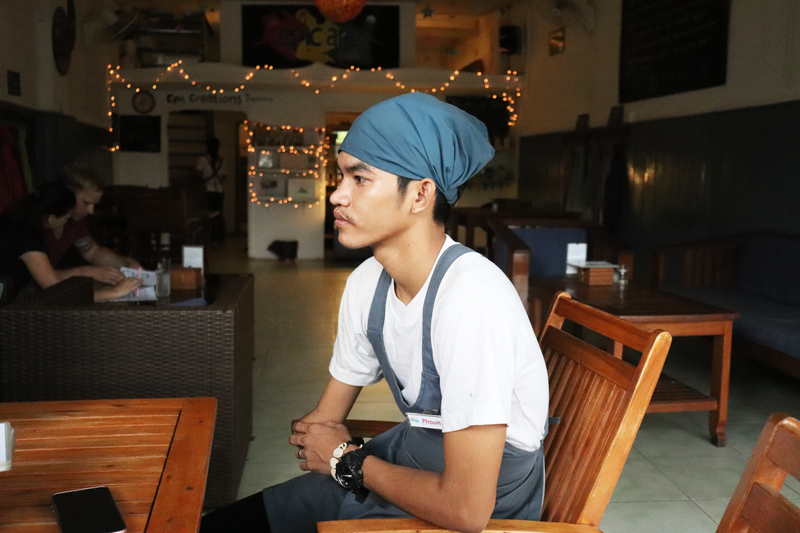 “I’m not rich but I’ve got a lot of friends now and I enjoy working at the café because it helps me to build confidence. Without Epic Arts, I would still be at home without any chance to develop myself or expand my talent the way I have at Epic Arts, that is why I’m very grateful for the inclusive environment that Epic Arts offers”. 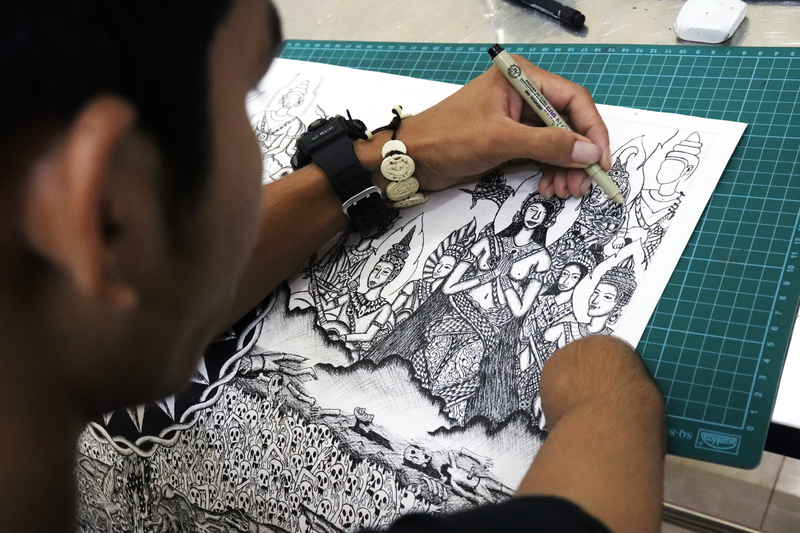 Three years after Phoun started at Epic Arts, he is now able to work full time as an artist in the growing Kampot art scene. He is currently being mentored and working together with Lauren Iida, an American artist he got to know through Epic Arts. He is selling his Khmer style drawings independently and pursuing his dream of opening a small gallery of his own one day in Kampot. “I don’t know what the future will bring but, I am so grateful for everything Epic Arts has done for me. 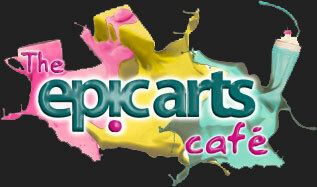 Epic Arts has helped me to become the artist I am today”. Make a one time donation or why not set up a monthly gift to support our students. Epic Arts has changed my life! Please donate to the Inclusive Arts course, your donations will change the lives of other young people with disabilities. Make a one time donation or why not set up a monthly gift to support our students.